I want the students at my school in The Bahamas to have more experience with literature from the Caribbean. The options are more limited than from other regions of the world, so I am encouraging them to check out books that may be below their reading level, but will add to their understanding of the cultures of the Caribbean, as well as give them more exposure to characters like themselves in books. I want to talk to the students about what they relate to in these books and what is missing, ultimately, with the goal of some students writing their own books about The Bahamas. 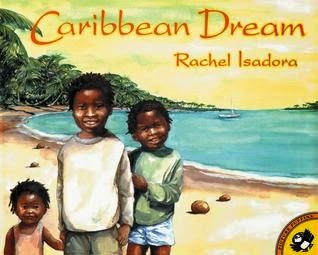 Rachel Isadora's Caribbean Dream is a gorgeous picture book with simple poetry about daily life in the West Indies. I like that the poems are easy to read and relate to the images, but really, the appeal here is in the illustrations. Every page in the book should be framed and displayed as an example of the natural beauty of the Caribbean. The moments Isadora captures will be recognizable to anyone who has visited the area. I will definitely be picking this up as a birthday present for all my friends who have toddler and primary aged children. As a Hispanic Studies major in college, I read many novels by Julia Alvarez, centered on Dominican characters. 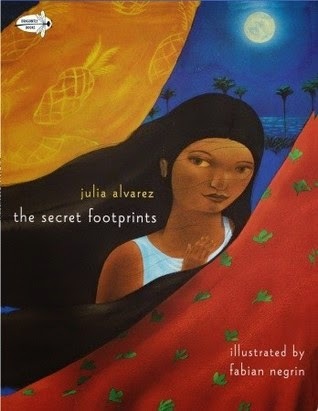 I've never read any children's books by her, though, so was excited to offer an option about the Dominican Republic to my students, who are too young for Alvarez's other novels. The Secret Footprints is based on the folktale of the ciguapas, creatures who live in underwater caves and have backwards feet so that humans could not follow and find them. The book tells the story of Guapa, a brave ciguapa who gets too close to humans and teaches her fellow creatures that people can be kind. This is a story that would have enchanted me as a child, imagining that every pair of footprints I see on the beach could belong to a ciguapa. Illustrator Fabian Negrin created dreamy images that had me focusing on the feet to see what we would look like if our feet were on backwards. In discussing this book with students, I would ask what details Negrin uses to anchor the book in a place. 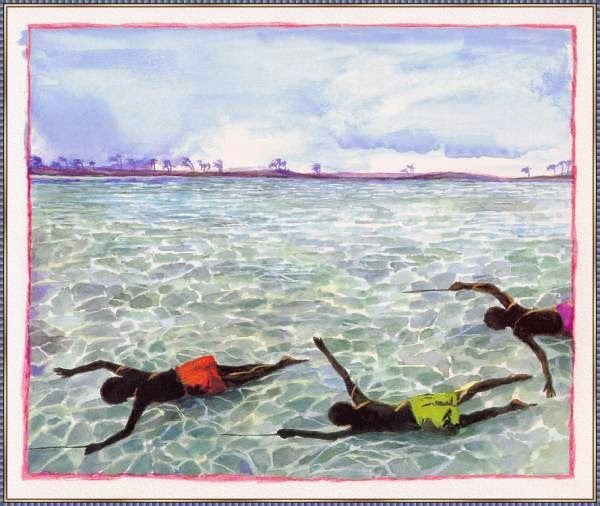 I would also ask what folktales from Bahamian culture would make a good picture book and why. This book is a treasure. The streamer-tailed hummingbird is better known as Doctor Bird, the national bird of Jamaica. 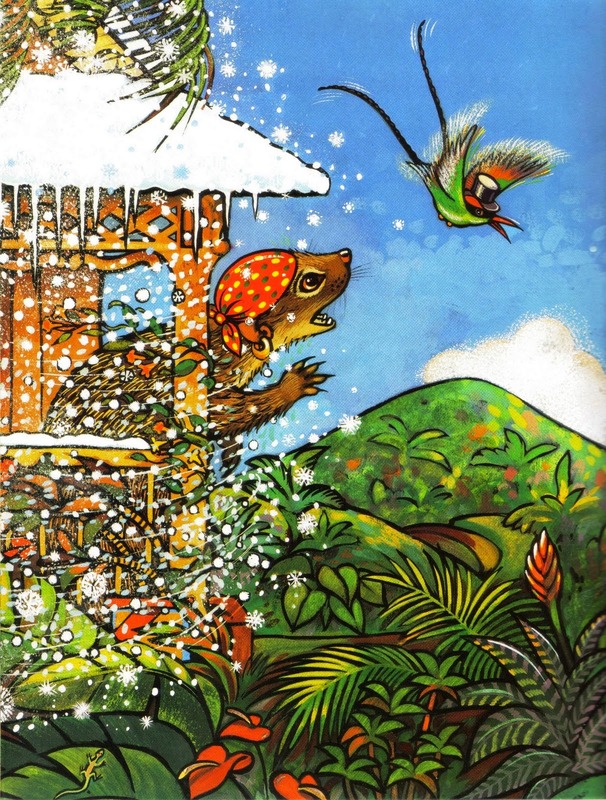 The three folktales in Doctor Bird: Three Lookin' Up Tales From Jamaica are about how he uses his magical powers to impart lessons to Mongoose, Mouse, and Owl. While Ashley Wolff's illustrations gave plenty to look at and Gerald Hausman used descriptive language, these are stories that beg to be told orally. At the end of the book, Hausman credits the Jamaican storytellers who inspired this work. Unfortunately, I would prefer to see them perform or listen to a recording than to read this book, which I found weighted down. Mongoose learns a lesson from Doctor Bird.